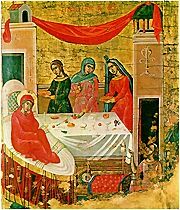 The Nativity of the Theotokos is one of the Great Feasts of the Orthodox Church, celebrated on September 8 (For churches still using the old Julian Calendar - for liturgical purposes - September 8 falls on September 21 of the Gregorian Calendar. In other words, "Old Calendar" Churches, such as the Russian Orthodox Church, still celebrate the Nativity of the Theotokos on the 8th, but the day is actually the 21st according to the everyday calendar that is used in society at large). The Holy Virgin and Theotokos Mary was born to elderly and previously barren parents by the names of Joachim and Anna, in answer to their prayers. Orthodox Christians do not hold to the Roman Catholic doctrine of the Immaculate Conception of Mary, in which it is supposed that Mary was preserved from the ancestral sin that befalls us all as descendents of Adam and Eve, in anticipation of her giving birth to the sinless Christ. The Orthodox believe that Mary indeed received the ancestral sin, having been conceived in the normal way of humanity, and thus needed salvation like all mankind. Orthodox thought does vary on whether Mary actually ever sinned, though there is general agreement that she was cleansed from sin at the Annunciation. Divine Liturgy is served on the day on the feast. The epistle reading is from Philippians 2:5-11, and speaks of "Christ Jesus, who, being in the form of God, did not consider it robbery to be equal with God, but made Himself of no reputation, taking the form of a bondservant, and coming in the likeness of men." The gospel reading is taken from Luke 10:38-42 and 11:27-28 together; this reading is also always read on all feasts of the Theotokos. In it, the Lord says, "blessed are those who hear the word of God and keep it!" The handmaid of God Mary is being born for us. Therefore all creation is renewed and rejoices! Heaven and earth rejoice together. "The barren one gives birth to the Theotokos, the Nourisher of our life!" Being prepared as the chariot of God the Word. She was fore-ordained for this, since she is the divine gate and the true Mother of Life. This page was last edited on September 19, 2010, at 22:14.